As part of an internship in public archaeology, some of our students will be periodically posting about their experiences at the Fort Vancouver Public Archaeology Field School. This will provide a different perspective on the school that will augment my posts. Enjoy! Jodi Marshall: I have been working on Block L (the Little Prouxl House Site) for the last few days and have found it challenging but very interesting. When we first uncovered the fill from the block that had been placed in it last year, you could clearly see the different levels of strata along the exposed walls. Doug Wilson mapped out eight new units to excavate west and south of the block. So far we have found a piece of flat glass, bits of charcoal, and a few wire cut nails. In the unit across from ours a piece of transferprinted whiteware was discovered. There have been many pieces of expended copper bullets (they called it shrapnel two years ago until they figured out they were bullets, probably shot at a target) found within my unit. Overall, it has been interesting peeling back the layers from different time periods and I am very excited to see what lies beneath. 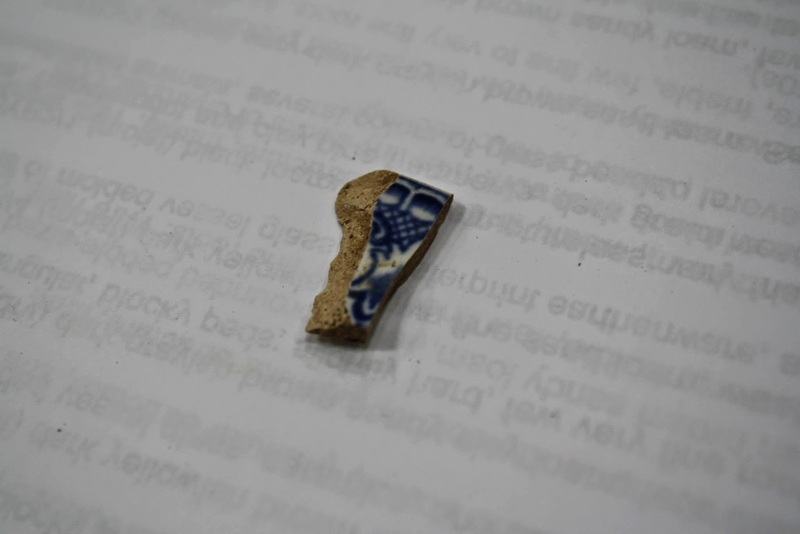 This field photo of a piece of transferprinted ceramic whiteware was found in 20th century deposits above the World War I railroad spur line. It is an out-of-context artifact that suggests that earlier fur-trade and early U.S. Army deposits are nearby. The weather overall has been good. There have only been just a small handful of people coming and visiting the dig site but I am sure this will increase as the summer progresses. We have been touring the fort as well and have been learning many interesting facts about not only the structures but the people that lived here as well. I was surprised to learn that General Ulysses Grant never actually lived at the Grant House (named in his honor after he had finished his presidency). It is also interesting that there were so many other buildings at the fort that were reconstructed based on archaeology. I am excited to start the excavation on the parade grounds at what we think is where the old flag staff was. Since there are no up close pictures of it, we are relying on old images of the landscape that include the flag staff. By looking at the pictures, it was very tall and could probably have been seen for many miles up and down the Columbia River. It must have been quite an impressive sight to behold as people traveled by.